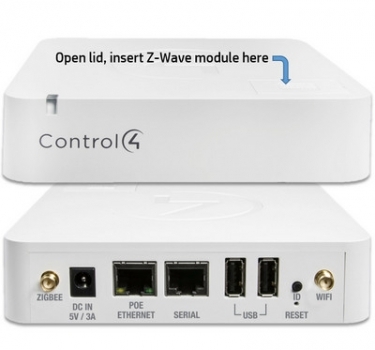 At ISE 2018, Control4 introduces most affordable smart-home controller yet: CA-1 with Wi-Fi, ZigBee, optional Z-Wave targets production-home builders. Introduced at ISE 2018, this little CA-1 home automation controller from Control4 'retails' for $350 and does everything a full-blown EA system can do except A/V -- ideal for home builders and consumers who want IoT controls, but not audio/video. Among professional home-automation systems, Control4 (NASDAQ: CTRL) is already considered “mainstream,” but the new CA-1 controller, introduced this week at ISE 2018, is downright affordable. It takes the best of Control4’s IoT solutions – including integration with lighting, energy management, security, surveillance, Alexa and more – and packs them into a $350 (MSRP) box. It has the same IP (Ethernet, Wi-Fi), ZigBee and serial control as Control4’s flagship EA Series, but it also incorporates Z-Wave more integrally than before – via a slide-in module, rather than an external dongle. About the only thing it doesn’t have is the EA’s slightly higher price tag (starts at $600 with a handheld remote) and audio/video capabilities (streaming media and IR control of A/V gear). "The new price point really is going to resonate with homebuilders and developers, even hotels." The CA-1 was built “specifically as a new entry point for homeowners who want peace of mind, comfort and convenience,” says Kordon Vaughn, Control4 senior director of product marketing, in an interview with CE Pro. Control4 keeps coming down in price, but the production-builder and MDU markets (hotels, condos, hospitality) remain elusive. True, Toll Brothers offers Control4 as an option for all new homes, but the large national builder has yet to develop a community that includes home-automation standard in every unit – the Holy Grail for all control companies, and pretty much every company that sells into new construction. Some smart-home vendors that go down-market create separate ecosystems and programming environments for their new offerings. Often, they do this to strip costs or artificially limit the feature set of the lower-priced options. Control4 doesn’t take this approach with the CA-1, which integrates with the same thousands of products that EA controllers already support. Users also enjoy the same feature sets, same user interfaces, and same personalization tools such as Control4’s new When/Then “DIY” engine. 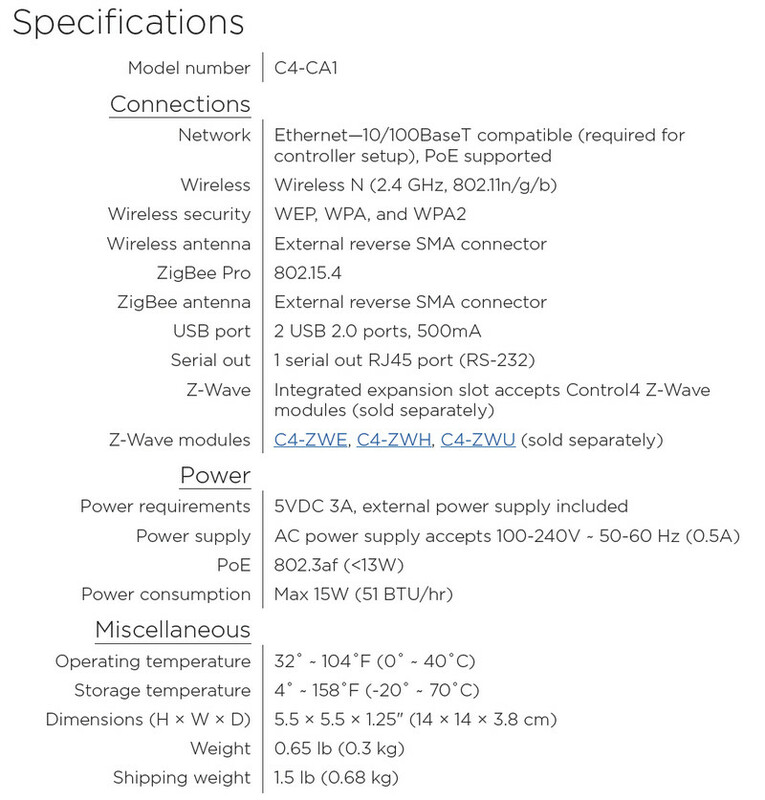 CA-1 incorporates Z-Wave home automation more integrally than Control4's EA hubs. Z-Wave modules are available for North America, Europe and Asia. In the case of the CA-1, Control4 dealers need not learn another programming environment, nor confuse the brand with different UIs and features. The approach also allows dealers to easily upgrade to an A/V-capable EA-Series controller. He adds that typically there will be little reason to “upgrade” to an EA-5 unless A/V is the objective. The CA-1 can support more than 100 smart devices and systems out of the box – already overkill for the typical entry-level home. For larger homes and projects, the integrator would simply start with an EA-Series controller. The Control4 CA-1 Automation Controller is the perfect entry point into Control4 automation built around security, comfort, and convenience solutions. It has built-in control for IP, ZigBee, and serial devices, plus an internal slot for a Z-Wave Plus™ module (sold separately). It is designed for homeowners, builders, MDUs, and hotels that want smart experiences that include smart lighting, thermostats, door locks, cameras, sensors, shades, and more. The CA-1 is the foundation that makes smart products work together to deliver rich, orchestrated automation —the smart home experience homeowners truly want.